CasinoPop – Secret Agent Tournament! Play for extra cash and Epic Spins! Win a share of €1,111 in cash! Join CasinoPop this weekend at the international secret agents’ headquarters in Stockholm. You have been assigned the mission to prevent The Evil Syndicate to take over the entertainment industry with their unfair methods. The Syndicate’s ultimate objective is to steal the Joy of Gaming from the citizens, and now you are the hand-picked agent to stop them. Be brave enough to fight for a position on the leader board to stop the Syndicates evil objective and place in the TOP100 for a share of the prize pool. 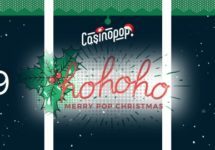 Exciting tournament running for four days at Casino Pop that will see players completing against their fellow agents to score the highest total equalized win over 20 spins and place in the TOP100 for a share of the prize pool with cash prizes and Epic/Free Spins. Everyone has time all weekend to post their best score with the tournament closing on Monday, 12th February 2018. The 20 best game rounds in a row relative to the bet size determine the amount of points and position on the leader board. Minimum bet is €1.00. Real money and bonus bets qualify for the tournament. The TOP100 scoring players by the end of the tournament will win a share of the prize pool, credited within 24 hours in cash, unless the winning score has been hit with bonus funds: 1st – €333 | 2nd – €222 | 3rd – €111 | 4th & 5th – €44 | 6th to 10th – €22 | 11th to 20th – 22 wager-free Epic Spins | 21st to 50th – 11 wager-free Epic Spins | 51st to 100th – 22 Free Spins.